Video: How a slim soundbar can produce 8-channel Dolby Atmos sound | What Hi-Fi? Fully immersive, cutting-edge surround-sound – including height channels – from a soundbar? Oh yes. Traditional systems involve multiple speakers – commonly five, arrayed around the room at ear-level, plus a subwoofer – as well as an amplifier and all the associated cables. That’s your standard 5.1-channel configuration. Audio specialist Dolby has taken that to the ultimate degree with additional speakers above the listener: its Atmos system creates an incredibly lifelike, immersive experience. But a full-on Atmos set-up means lots of cables, and maybe even speakers mounted within your ceiling – which could be a tricky project to undertake. 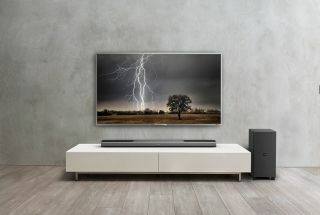 A soundbar takes things in the opposite direction: one unit, filled with speakers firing in different directions (bouncing sound off the walls back to the listener), and minimal wiring. But generally that sound is on the same plane as the listener. The Fidelio B8 combines Dolby Atmos with that sound-reflecting technology. So you get sound from above and all around, with the convenience of a soundbar. The Fidelio B8’s 18 individual speakers are arrayed in the 53mm-thin soundbar to bounce sound all over the room, including off the ceiling and back down to you on the sofa. It connects to a discreet wireless subwoofer too, for maximum neatness. The height effect comes from ten speakers in the top of the bar, while the surround-sound effect comes from two at the sides. The remaining six fire straight at you. Also on board is Philips’ own Ambisound technology, which uses clever psychoacoustic tricks to make you feel as if the sound is coming at you from several directions. And while the system might be svelte, there’s nothing small about its power: the B8 packs 400 watts of amplification, while the subwoofer pumps out 220 watts of bass from its downward-firing 8in driver. The Fidelio B8 isn’t just limited to movies, either. It has built-in aptX Bluetooth for streaming CD-quality music from mobile devices, and NFC means pairing is as simple as tapping compatible products to the soundbar. Fully immersive surround-sound doesn’t come much cleverer than the Philips Fidelio B8 – or much neater.